Universe! Hey old friend, what are you doing in a photo of the day blog post? There was a disturbance in the force and I had to check it out. 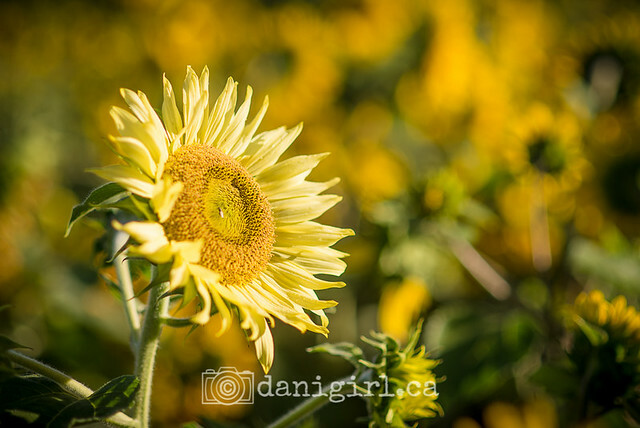 You were radiating happy when you were out playing with your camera in the morning’s first light in a sunflower field. What’s up with that? Oh wow, those sunflowers! So many, so gorgeous, and what a perfect morning for it. Who knew there could be so many varieties? Some were easily 10 ft tall, some were purple, some were tiny. It was photographer heaven! I’m not surprised I was radiating happy. Were you surprised to find such a treat so close to home? I really was! I’d been chatting with the owner of the farm online since February, and I knew she was more or less local – but I didn’t realize until I went out there that she’s literally 10 minutes away from my house in Manotick! How did you find out about the sunflowers? The owner, Kristie, sells cut sunflowers for $5 a bunch, and also sells sunflower stalk kindling and makes art out of the stalks. She makes trellises, frames for chalkboards and mirrors, all sorts of interesting designs. 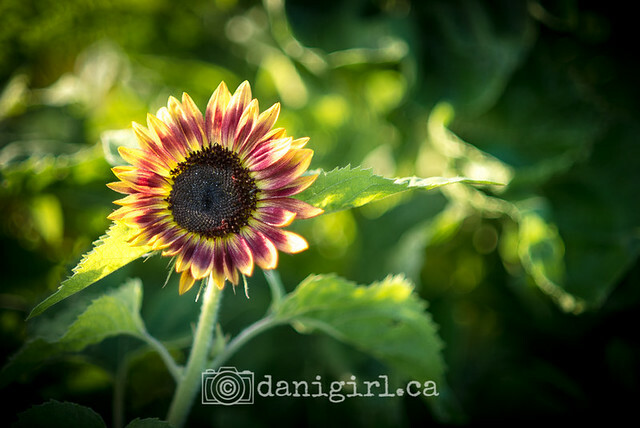 We started chatting on line, and I asked her if it would be okay if I came out to poke around with my camera when the sunflowers were in bloom. She truly is! And the sunflowers are incredibly lovely, too. 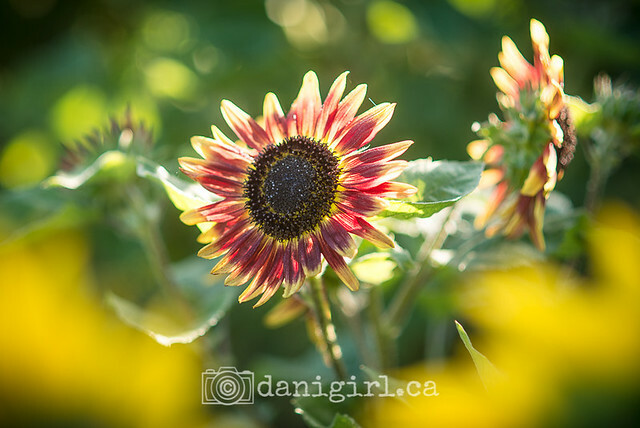 She planted more than 7,000 seeds, and nature helped jumble a lot of them together, so the field is like a crazy quilt with sunflowers every which way. They are every colour you could imagine – yellows, oranges, purples and pinks! 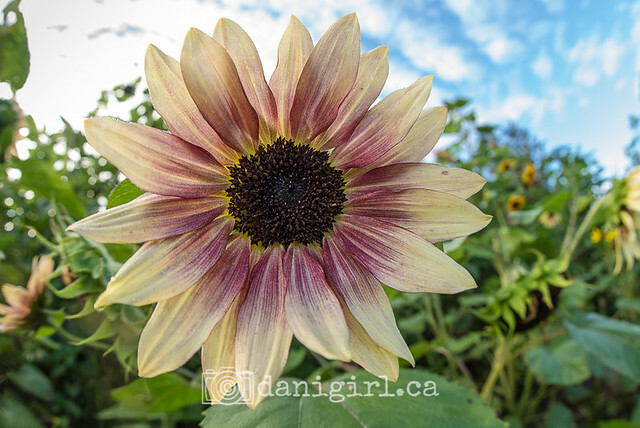 Who knew sunflowers came in pink and purple and black? Each one seems to have its own personality. I’m sensing a bit of covetousness here. It’s true! Living in an old farmhouse surrounded by sunflowers? Move the whole shebang to PEI, plunk it down by the ocean and it’s DaniGirl’s House of Dreams! I’m also sensing a bit of conflict. Sigh, yes. I have a bit of a dilemma. 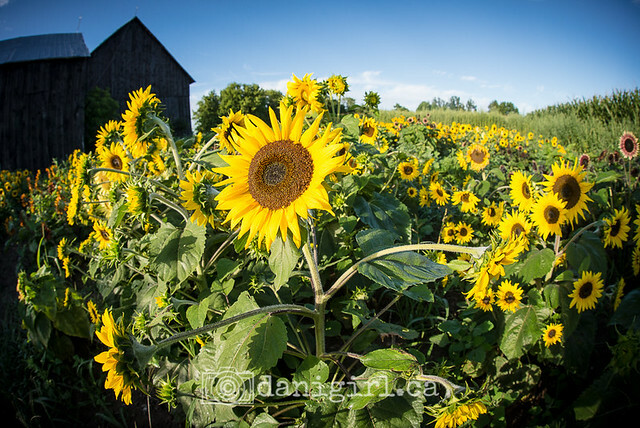 I’ve found this incredibly photogenic field of sunflowers practically around the corner from me, and part of me wants to go there every day and just take pictures – morning light, hazy light, twilight, macro, wide angle, details, bees, tight crop, shooting up, shooting down — I had a hard time leaving in the first place! Did Kristie mind the idea of you taking photos? Not at all! 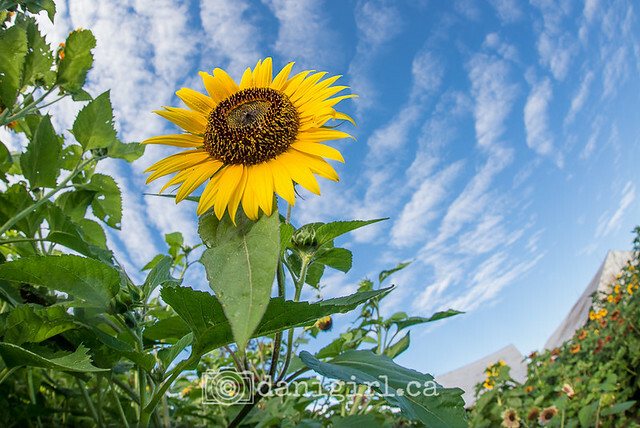 She was so nice, and she was even open to the idea of me hosting sunflower photo sessions in her field. How fun would that be? People love sunflowers! Very fun and very popular, I’ll bet. So what’s the problem exactly? So here’s my dilemma. As I said, people love sunflowers. 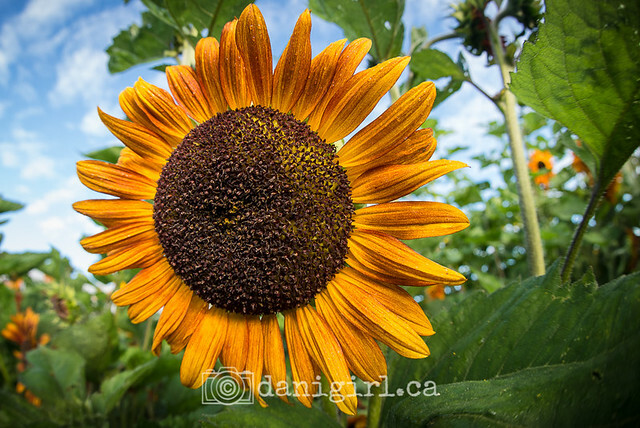 I see postings in local photography groups all the time with people asking for sunflower fields. If I tell people about this treasure, it’s not my secret sunflower place any more. But Kristie is trying to sustain a business of sunflower farming, and I can help promote her. 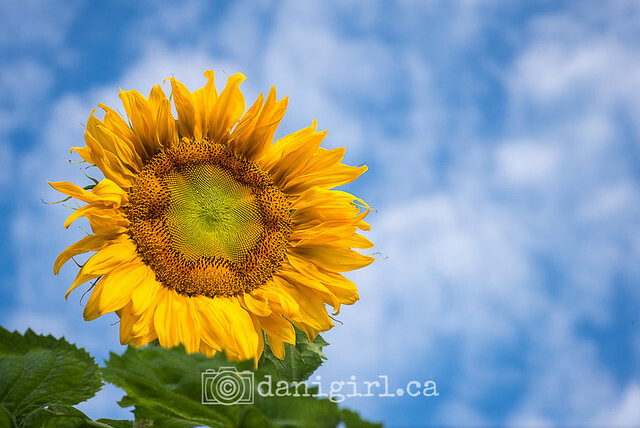 Aside from the photographers, I know lots of people who would love the idea of just dropping by her place 15 minutes outside of Barrhaven to pick up a bunch of fresh-picked, locally grown and truly beautiful sunflowers for only $5. Ah, I see. Photographers are a little proprietary about good locations, are they? Well, yes, that’s true. But I also would want people to be respectful of Kristie and her field. Maybe everyone who goes out there to take photos also makes sure to make a donation, or buy a bunch of flowers on the way out? That way she can have a sustainable business, and we’ll have a beautiful local sunflower field for years to come! She was telling me a little bit about the work involved, and it’s neither cheap nor easy to grow that many sunflowers! 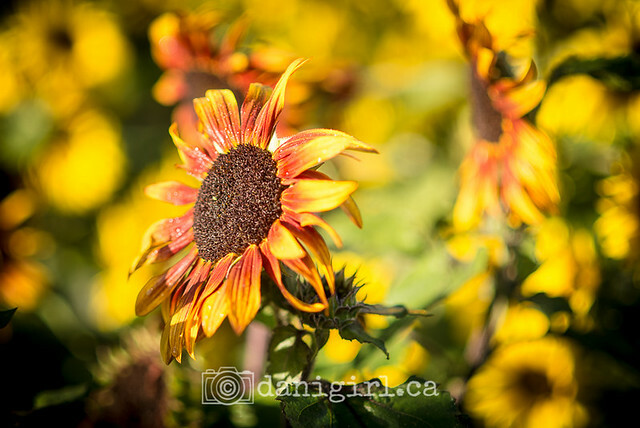 So how do people find this hidden sunflower treasure? 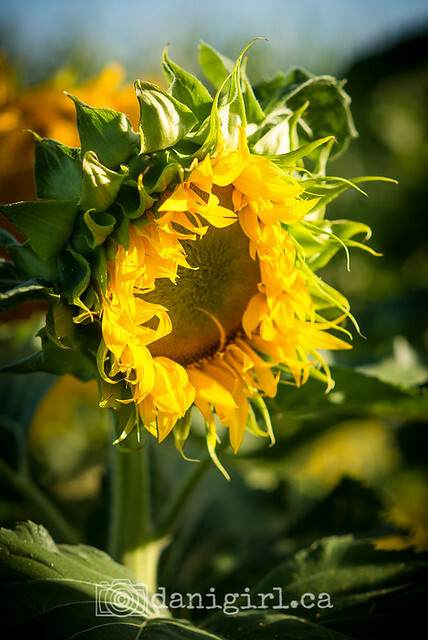 You can find Kristie’s Keys Sunfields page on Facebook, and you can pick up fresh sunflowers at the end of the lane from 9 am to 8 pm at 5939 First Line Rd. If you’d like to pay a visit, please message her first. 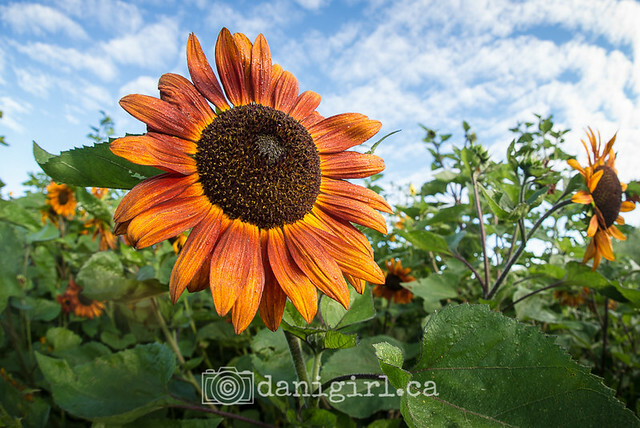 And when will you be hosting your sunflower field portrait sessions? I’m working on the details for that, but it will be a weekend in the near future. Spots will be very limited, though – if you’re super keen, message me for details and I’ll put you on the waiting list. Watch this space for an announcement soon! I’ll make an appointment with my stylist and get back to you. You’ll need a wide, and I mean w-i-d-e angle lens for me, though. Lovely sunflower photos, by the way! Thanks Universe! I’m glad you checked in. We’ll chat again soon! I feel like I would simply never leave. Absolutely beautiful flowers and as always gorgeous photographs. Holy crap, woman. These are incredibly gorgeous. I can’t think of a better place to have family pictures done. Amazing. of course I am not shooting underwear shots, but if I were, you could come and help with the equipment 🙂 snort.